AFRMA - Oats are Oats, Right? As I was preparing for a recent show, I was a little surprised to find that several of my mice were looking a little thin, including one of my large males who has a very healthy appetite and tends to be a little chubby. This was all confirmed by the judge at the show. We discussed the possibilities, but nothing had changed in their diet. The only thing that was different was the brand of oats that I was using . . . I had run out of my usual organic brand a couple weeks before the show so I just picked up a couple large containers from the grocery store. But oats are oats . . . right? 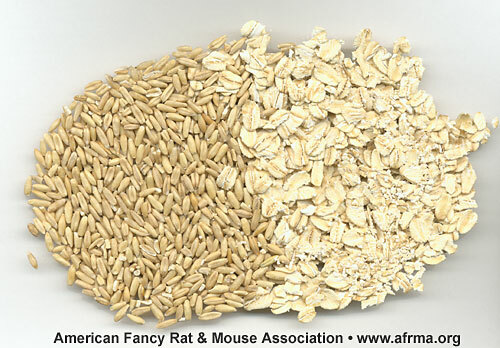 The diet for my mice is very simple: the base is an unlimited supply of Teklad 8604 lab blocks which has been used by breeders for many years, a serving of mixed grains (once a day for most mice, a little more often for babies and retired mice), and occasional whole grain breads and fresh vegetables. Over time I’ve become more generous with their grain, and since it’s a healthy supplement and they love it so much, it’s become a quarter to a third of their diet. The grain mix has also evolved over the past couple years—it used to be just high quality organic rolled oats, now it includes other rolled grains. Several days after the show I was cooking some oatmeal for breakfast (the kind the mice usually eat) and casually glanced at the nutritional information, it was 150 calories for a 40 gram serving with 5% fat. I was pretty surprised to see such a high fat content. Out of curiosity I checked the nutritional information on the grocery store oats that the mice had been eating . . . it was only 120 calories with 2% fat. I was shocked at the difference. Later that day I picked up more of the organic mixed grain that I add to their oats and found that it was 170 calories with 8% fat. So much for “oats are oats” . . . turns out they aren’t even close! No wonder everyone was looking thin—I had inadvertently put them all on a diet. But I didn’t realize how bad it was until I started adding everything up. It turns out that I had dropped the calorie content of a major portion of their diet by at least 25% and dropped the calories in their overall diet by as much as 10%. And since the babies preferred the grain to lab blocks, it was even worse for them. Of course I switched back to the “good stuff” and it wasn’t long before almost everyone was looking healthy again. Unfortunately, the exception is a litter that was young at the time and it’s beginning to look like they will always be a little on the small side. I’ve always been an advocate for reading nutritional labels, but now I’m not reading them just for me . . . I’m reading them for my pets too. Oat groats and rolled oats.